Most people have had experience with the web. But you may not have experience using the web on the go, in general, and on the Samsung Galaxy Tab, specifically. This should get you quickly up to speed with viewing web pages and basic browsing on the Galaxy Browser app. 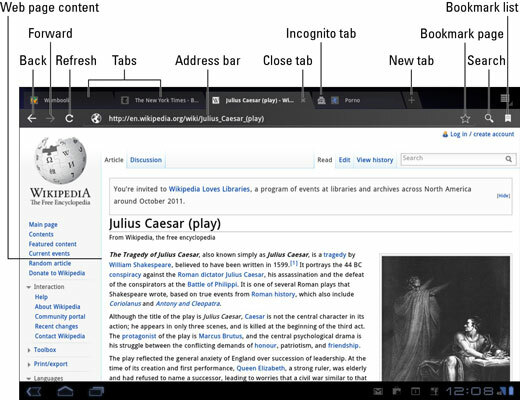 Your Galaxy Tab’s web-browsing app is named Browser. You can find its icon on the main Home screen or, like all the other apps on the Tab, it’s on the Apps Menu. Pan the web page by dragging your finger across the touchscreen. You can pan up, down, left, or right when the page is larger than the Tab’s screen. Pinch the screen to zoom out or spread two fingers to zoom in. You can orient the Tab vertically to read a web page in Portrait mode. Doing so may reformat some web pages, which can make long lines of text easier to read. To visit a web page, type its address into the Address box. You can also type a search word or phrase if you don’t know the exact address of a web page. Touch the Go button on the onscreen keyboard or the Go button by the Address box to search the web or visit a specific web page. If you don’t see the Address box, touch the web page’s tab atop the screen. The Address box, along with the various buttons left and right, appears on the screen. You “click” links on a page by touching them with your finger. If you have trouble stabbing the right link, zoom in on the page and try again. When typing a web page address, use the www. key to instantly type those characters for the address. The www. key changes to the .com key to assist you in rapidly typing those characters as well. To reload a web page, touch the Refresh symbol on the left end of the Address bar. To stop a web page from loading, touch the X that appears to the left of the Address bar. The X replaces the Refresh button and appears only when a web page is loading. To return to a web page, you can touch the Browser’s Back button or press the Back icon button at the bottom of the screen. Touch the Browser’s Forward button to go forward or to return to a page you were visiting before you touched the Back button. To review the long-term history of your web-browsing adventures, touch the Bookmarks button in the upper-left corner of the Browser window. Choose History to view your web-browsing history. To view a page you visited weeks or months ago, you can choose a web page from the History list. 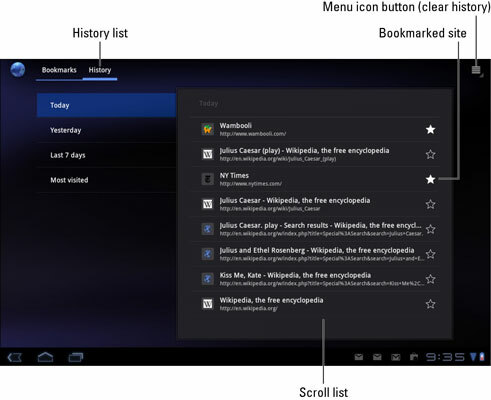 To clear the History list, touch the Menu icon button and choose the Clear History command.